Since being in Japan a mixture of work commitments and general inconvenience has limited most of my local football action to Tuesday night Asian Champions League games with the odd exception here and there. It’s not often that a Rochdale fan can be accused of being a glory hunter but that’s exactly what my mate Glen has taken to calling me whilst he swans off around Tokyo taking in the action in the local parks and so on. It should come as no surprise then that last weekend my other local football following mate Neil and I managed to snag a few tickets for the biggest game in the Japanese season: the J1 finale between Urawa Reds and Kashima Antlers! 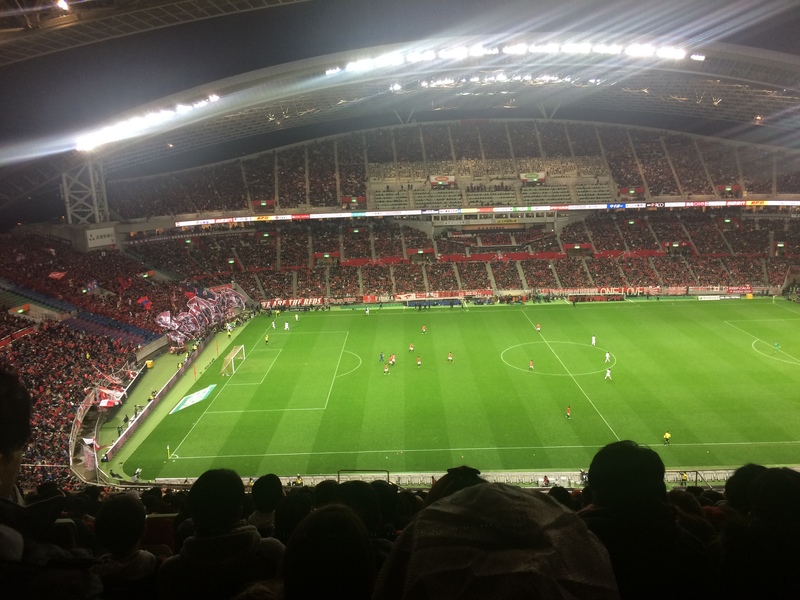 The second leg of the two-legged tie would take place on Saturday 3rd December at Urawa’s Saitama Stadium and – despite it being an instant sellout – Neil managed to bag us a pair of tickets for an ever so slightly inflated price of ¥6,500 each. A bit more expensive than our last footballing day out, but you have to pay the price to jump on the bandwagon I guess! Unfortunately for us, working at an English conversation school in Japan often means that Saturday is a non-negotiable work day for many. Neil and I are no exceptions, so it would be a case of heading up to Saitama after work; this wasn’t such a big deal for him as he had a nice cushty finish around 3pm whilst I found myself slaving away until 5.50pm in the middle of Tokyo. He even had time to go home and get changed before the match. Alright for some, eh?! There’s always one who lowers the tone. And yes, this was the only picture I got of us all night. My journey to the game was anything but the casual stroll Neil could enjoy. My aim was to catch the 18.03pm train which would get me into Urawa-Misono around 19.10pm. First of all I had the small matter of finishing a junior high school class, and made the rather smart decision of packing away the materials as the lesson went on. After that finished (on the dot! ), I was out of the door before the student and after a quick toilet stop, legged it to the nearest FamilyMart for a couple of train tinnies. …all in seven minutes! Pretty damn impressive, even if I do say so myself. The journey itself involved one quick change at Nagatacho and was pretty painless as I arrived at my destination with 25 minutes til kick off. 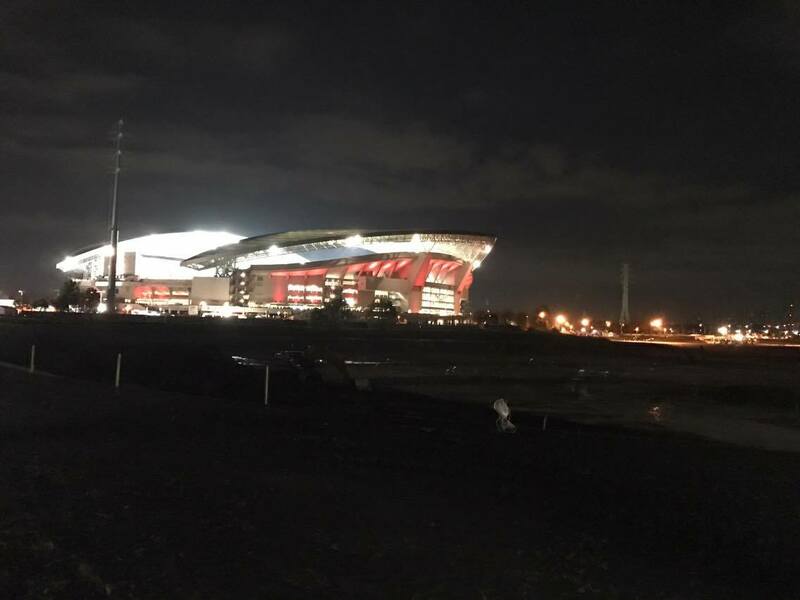 Unfortunately for me the stadium was a 20 minute walk away and I was out of beer, so after a quick pit stop at 7/11 I cracked on with the pilgrimage to the impressive Saitama Stadium. 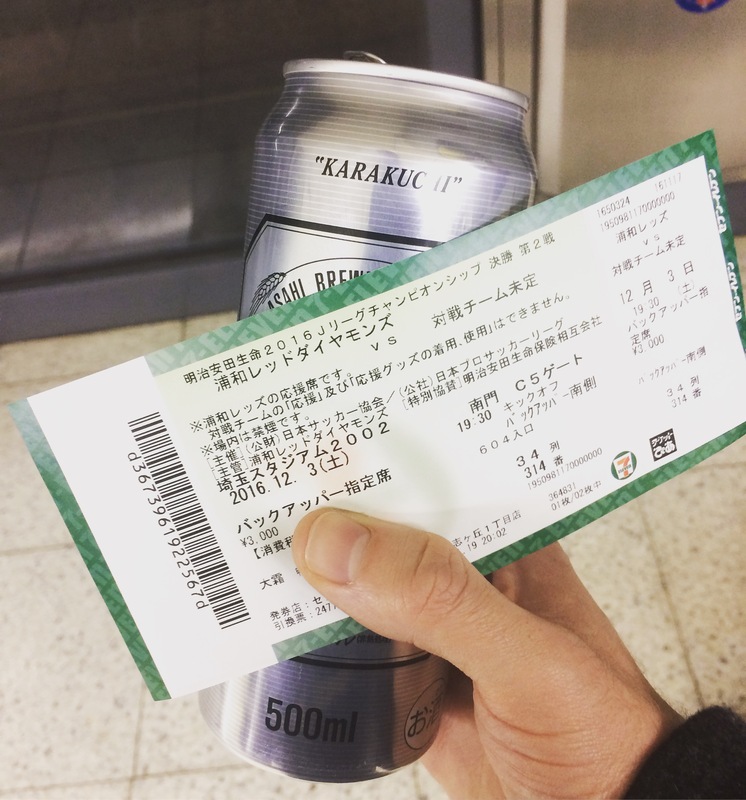 One of my favourite things about Japanese football is the fact that you’re allowed to take beer into the stadium providing you pour it into a paper cup. This of course is a last resort as it’s much better to just smuggle them in so you don’t have pre-poured beers in front of you going flat for 90 minutes. Believe it or not, this is almost a close-up in comparison to when you get out of the station! The problem I found was that I had made a conscious decision to take my smaller, ultra metrosexual man bag to work instead of my usual rucksack in which cans of beer can be covered up with a jumper or something similar. Although the bag searches aren’t strenuous by any means, there was no chance of hiding even a single can in this bag. Not one to give up without a fight however I started with my rather ridiculous plan A, which involved tucking them into my trouser waist and fastening my belt as tight as possible. I don’t know what the people walking past must have thought when they saw a guy undoing his belt, putting a few cans of beer down there and then fastening it up again before waddling a few yards before realising it was never going to work and taking them out again! Plan B was much simpler and it’s probably quite ridiculous that I didn’t think of it in the first place. Due to the cold winter nights I was wearing my thickest, longest coat which just so happened to cover all my trouser pockets. Despite the routine bag searches, it seems body searches aren’t a thing in the J-League so all I had to do was fill my pockets and my jacket would do the rest; easy street! As is often the case with Japanese football despite the 19.30pm kick off time advertised, the game itself didn’t get underway until about five minutes after that. I don’t know why this always happens but I’d guess it’s for TV purposes. I wasn’t complaining this time anyway as it gave me an extra five minutes to get into the ground and I managed to find Neil and my reserved seat just as the team’s were kicking off. How’s that for timing?! Urawa took a 1-0 aggregate lead into the second leg and seeing as they were at home they had to be considered the favourites for the title. It seemed like the first goal would be an important one and when Shinzo Koroki volleyed Reds in front after just seven minutes Neil and I both thought the tie would be over. The first half continued much in the same vein and Kashima didn’t even look like getting a shot off, never mind actually scoring an equaliser. With this in mind it was something of a shock when Mu Kanazaki headed home a back post cross just five minutes from half time. Antlers were level on the night but still trailed 2-1 on aggregate when the half time whistle blew. That goal though meant it was very much still all to play for with 45 minutes remaining. I’d be lying if I said I remember all that much of the second half as the beers were starting to pile up as was the conversation and consequently our focus on the goalless second half waned a little. That was until the 79th minute when Antlers substitute Yuma Suzuki absolutely burned Tomoaki Makino for pace and forced the Reds defender to make a desperate tackle inside the box as he was bearing down on goal. That man Kanazaki stepped up again to bury the penalty for his and Antlers’ second of the night as they took a 2-1 lead. What followed next was confusion for the pair of us, as we found ourselves unsure as to whether away goals counted or not in these playoffs. 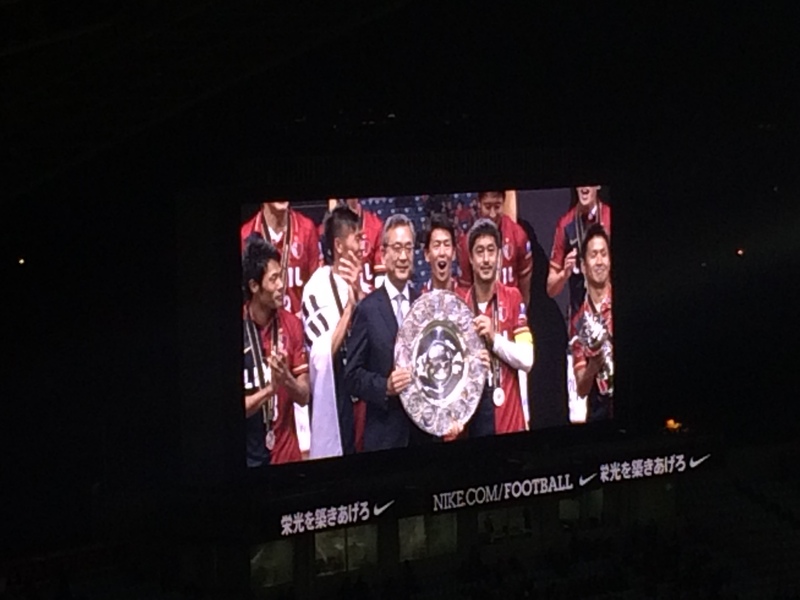 If they did, then Kashima would be crowned champions had the score remained the same. If not then extra time was on the cards. 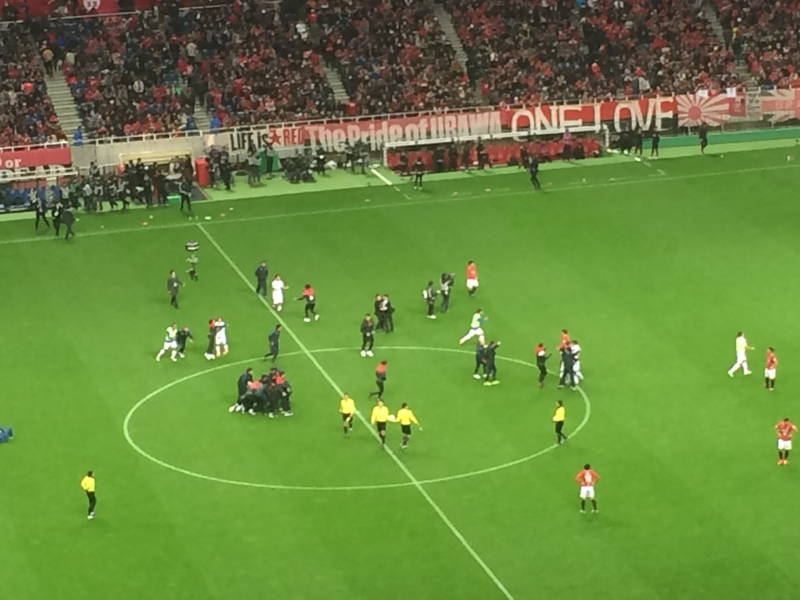 Celebrations at the final whistle for Kashima…turns out away goals did count! 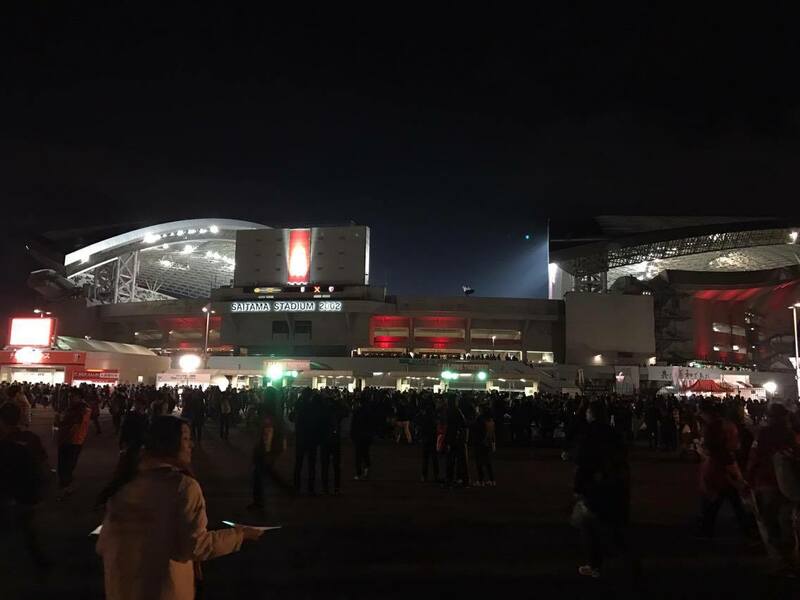 Despite some frantic Googling we couldn’t find anything online, but the growing frustration of the home fans couple with their side starting to throw the kitchen sink at Kashima’s backline told us what we needed to know: away goals counted and Urawa were losing. As Chris Kamara once said they weren’t just throwing the kitchen sink, but the pots and pans as well and Reds’ frustration was summed up as striker Yuki Muto blasted an effort well over the bar deep into stoppage time and that was that. 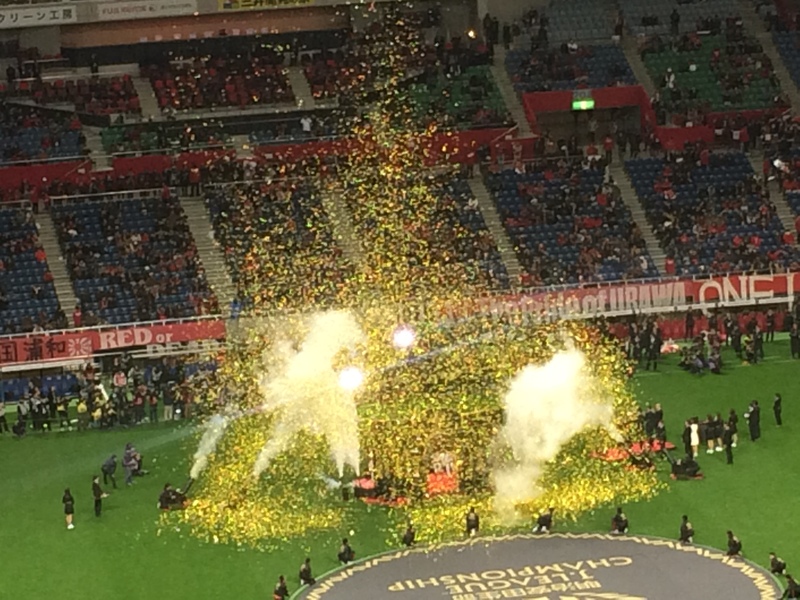 The referee blew the whistle shortly after and Kashima Antlers – despite finishing 15 points behind Reds in the regular season table – were crowned champions. The J-League’s championship system has been much maligned presumably due to results like this determining the fate of an entire season and will be scrapped in favour of a normal format as of next year. I can’t claim to be an expert on the subject but it’s safe to say this two year experiment hasn’t been the most successful. 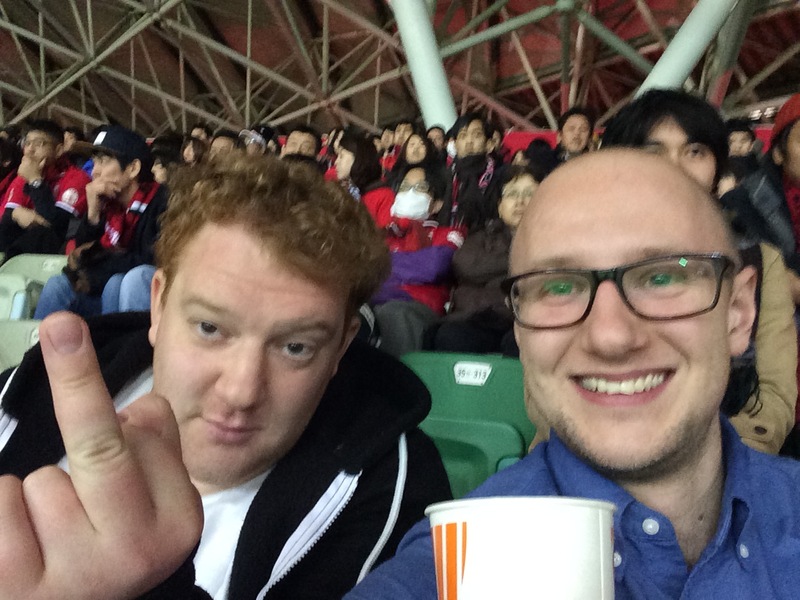 That said, Neil would have done anything before the match to see Urawa lose so I know of at least one person who approves! The 2016 J1 champions celebrate with their travelling fans. 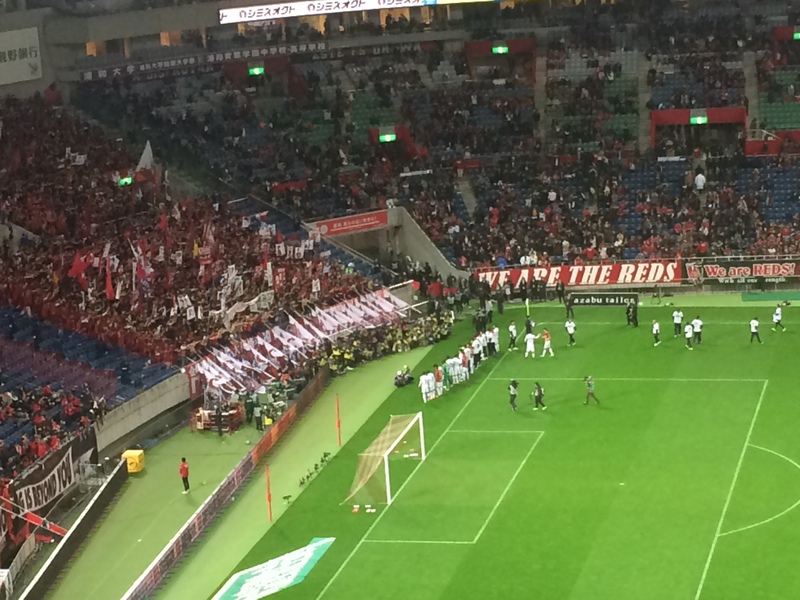 There was a rather predictable exodus of a number of Urawa fans at the full time whistle although a number also stayed behind to applaud their team off and presumably the winners too. I can’t really blame the fans for leaving – to have your season decided over two games despite finishing the full season with the most points has got to hurt! As we weren’t in a rush (almost 60,000 people cramming into the train station? No thanks!) we hung around for the glitter filled trophy presentation and celebrations that followed. More glitter than, erm…something very glittery indeed. Despite not really knowing half the stuff being said and presented, one thing I did pick up on was a cheque for ¥1,000,000 being presented to the MVP which felt like a very American touch to a clearly American inspired league system. Still, I wouldn’t mind being handed a million yen for 90 minutes work! We left the stadium some 30 minutes after the game ended and the crowds traipsing back to the station were still huge. The queues when we got to the station were even more ridiculous so we decided to hang around a little longer and wait for it to die down. Bit weird, taking a picture of a screen, isn’t it? Unfortunately Urawa-Misono appears to be the only train station in Japan without a watering hole nearby so instead we had to settle for a supermarket beer to chug on the street until the queues reached something of an acceptable level. From a neutral perspective I have to say it was nice to have a cup final atmosphere at the end of a season, although it does seem a bit of an injustice for Kashima to have won it. With the league going back to a normal format next year it’s nice to be able to say we’ve witnessed a piece of history with the potential last ever playoff final in the J-League. How’s that for glory hunting? Now, where’s my Kashima Antlers shirt…? ← A Typically Japanese Dining Experience?